Sweed model 300 strap chopper is a tough, economical chopper that will be the saving grace for companies looking to recycle strapping. 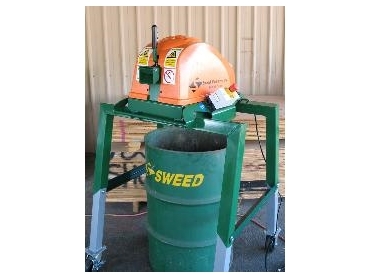 Sweed model 300 strap chopper assists in creating an effective recycling program by converting strap into saleable waste. The initial cost of the Sweed model 300 strap chopper or rental charges are often offset by reselling the scrap waste to a scrap dealer. Sweed model 300 strap chopper are made with usability in mind. It is as simple as introducing the strap into the in-feed funnel. Sweed model 300 strap chopper will then continue to pull the strap through at a hi-speed rate of 33metres per minute until the strap is consumed. The chopped strap ends up in a 200 litre drum or PP sack. A complete range of Sweed Choppers are in stock at Australian Warehouse Solutions (AWS) and can be rented or purchased.